PalmOasis Management Inc. has refined programmed services to benefit all our owners. Whether you are an investor with a large portfolio of properties, or an individual in need of professional services for your primary home, we can help. 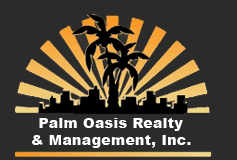 PalmOasis Management Inc. has several services to better suit your needs; Long Term Management , Absentee Owner Management, Vacation Home Management and Tenant Locator Services.